NACOGDOCHES, Texas - Stephen F. Austin State University alumni, front left, Jason Anderson, vice chair for the National Academy of Television Arts and Sciences in Dallas; Bill Lowry, senior producer for Texas Instruments and Powerhouse Films in Dallas; and Kevin Manuel, remote tech manager for CBS Sports in Houston, shared their broadcast television experiences with SFA students Wednesday during the Department of Mass Communication's Media Day. 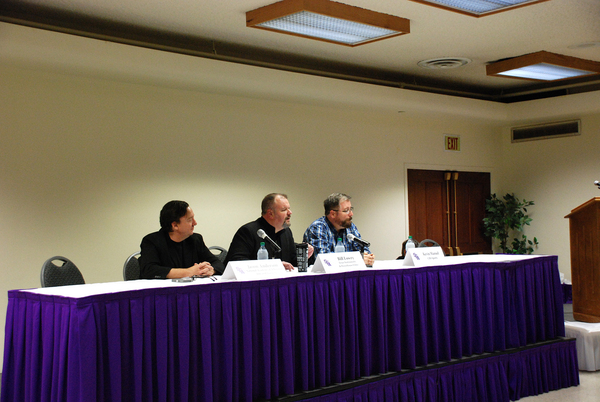 Throughout the day, four panels of media professionals discussed topics on journalism, radio, broadcast, public relations and marketing. Panelists answered a variety of questions, including how and why they chose their careers, how their work has changed through the years, and what it is like to work in the media industry.